Aloo baigan or potatoes and brinjal / aubergine / eggplant is one of those easy Indian recipes, that get ready very quickly and are healthy too. In northern India this recipe is know as aloo baingan ki subzi. 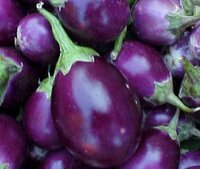 The kind of aubergines used in this are the small purple colored ones. 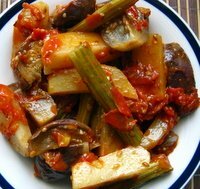 Another vegetable that makes this dish very healthy is vegetable drumsticks. If you are not familiar with what a vegetable drumstick is, here is a short description. Moringa oleifera, commonly referred to simply as moringa, is a very nutritious vegetable tree. The moringa pods or it's fruit is what is known as vegetable drumstick (because it looks like a drumstick). In Hindi they are called sahjan ki falia, in Tamil it is murungai. Peel and cut the potatoes into wedges. Slit the brinjal /baigan into 4 pieces (vertically). Put them in bowl full of water, otherwise they will oxidize and go brown and black. Prepare the drumsticks and cut into 4 inch pieces. If using the vegetable drumstick for the first time, this is how you can prepare it. Wash and pat dry, snip off the tip by using a knife and just before you have almost completely snipped it off, do a peeling action. you will see that a little skin comes off. That's it, all you have to do is peel a little skin off, not all, just little and cut it into 4 inches long pieces. Then boil them in little water for 5 minutes or steam them in a microwave for 4 minutes. Keep aside. Heat oil in a kadai or cooking pot, add the cumin seeds and when they crackle and impart a nice aroma, add the drained potatoes and aubergine pieces. Stir them and cook on a high flame for 5 minutes, stirring in between. Add the tomatoes, green chili, red chili powder and salt. Mix well and cover with a lid. Simmer for 10 minutes or until the vegetables are cooked. Do give a stir or two in between to avoid them sticking at the bottom of the pan. No need to add any water as the veggies will cook in there own water. When nearly done, add the drumsticks and mix well. Enjoy this aloo baigan subzi with chapati and dal. You should not eat the whole drumstick as it is. Just scoop out the pulp and seeds out of the drumstick and eat that, throw the rest away.